As part of our "Authors into Schools" programme we will taking three authors to the St Leonard's Community Day Fair on Saturday 14 March. My thanks go out to the parent organisers of the Fair for their invitation to be involved. You can find our two author events in the Junior activity area in the middle of the school grounds by the large trees. 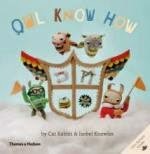 Join Cat Rabbit and Isobel Knowles for our story time with the Owl Know How story, get a sneak preview of their new book, Too Much for Turtle, visit some of the sets from the stories and have fun in our tree house drawing activity. These lovely picture books are suitable for ages 2 and above. George Ivanoff will entertain the children reading excerpts from his fantastic "You Choose" adventures. These are interactive books where the reader gets to make key decisions about how the story progresses. Numerous intertwining story paths and a plethora of different endings combined with a variety of genres and an odd assortment of really weird characters provide a roller-coaster ride of a reading adventure. Each book is a standalone adventure. Suitable for grades 2 and above to read to themselves but can be enjoyed by all school age children. All books except Too Much for Turtle will be available to purchase from the Ulysses Bookstore table in the marquee on the day or if you already own a copy bring them along as the authors are happy to sign their books for you. 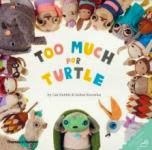 We will be taking pre-orders for Too Much for Turtle.